So, you’ve got a side hustle and are ready to replace your day job. Or, maybe your entrepreneurial dream is ready to be launched. Maybe you've already launched a business, but it’s stuck. If any of those scenarios fit you, then it’s time for The Make It Real Pursuit. Using Succeed On Purpose’s Business Launch Program, you will receive actionable tools to launch a new venture or grow an existing business. This program is delivered through online training and personal coaching from Succeed On Purpose founder, Terri Maxwell. Whether your business is established or still a dream, this program works - and we unconditionally guarantee your satisfaction. How to align your business with who you are and what you were born to do. Clarify a target market and determine what they want AND need, so you can differentiate your business from competitive options. Develop a packaging and pricing model to position your product or service in a way that will ensure prospective customers CHOOSE you. How to authentically generate demand for your product or service (versus sell!). How to accelerate business success and completely replace your income. This 8-module course is designed for entrepreneurs who want to develop powerful strategies to build a meaningful AND financially successful business. You'll be given access to our well-known, online Business Launch program. You can review and revisit the material at any time. 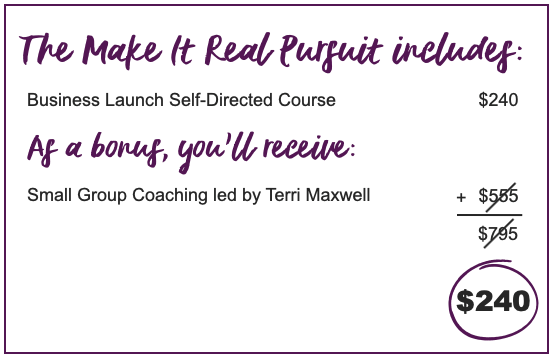 As a gift, you'll also receive small-group coaching sessions with serial entrepreneur and Succeed On Purpose Founder, Terri Maxwell. Together, working with 5-10 entrepreneurs, you will participate in live and interactive coaching, delivered virtually in a small group setting. Are you ready to build your business? We'll show you the way! Step 1: Purchase the Business Launch Self-Directed Course. Step 2: Watch for an email to access the Self-Directed course and schedule Coaching. Step 3: Begin The Make It Real Pursuit and build your dream business! "I landed my largest client ever before the course was even over!"